There have been many clubs which have done well consistently well over the post-war period without winning a national event on the road or country. Clydesdale Harriers is one of those and there are others such as Springburn Harriers which come into this category. It is maybe appropriate that we look at these two clubs at particular periods in comparatively recent history. In the period with which I am dealing here, the standard nationwide was probably higher than at any other time – with Olympians running for Shettleston, Edinburgh Southern and Law and District, Commonwealth Games men racing in the colours of several other clubs plus international runners from other home countries (Dave Logue, Ian Hamer) it was not at all easy to succeed at the very top level. For instance in the early 1970’s Clydesdale Harriers was in the first six in three consecutive years and I would suggest that what separates clubs in that grouping from the very best is the absence of one or even two international class athletes, and that the standard at various periods is otherwise of the highest. In the period in question the team won the District Championships three times and won medals eight times. There were also other very good results – second in the District Relay for example – which will become apparent as we go through the mini-profiles. The main men are well known: Ian Donald, Allan Faulds, Phil Dolan, Ian Leggett, Doug Gemmell and they will all be dealt with here. 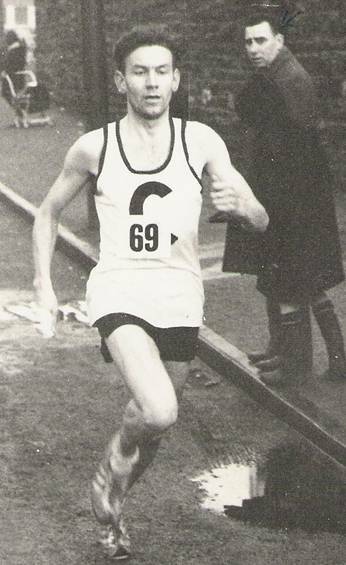 Ian was a quality athlete who continued to run well and win many individual races, particularly on the hills, he led the Clydesdale team to significant victories in County and District Championships and in many road and hill races. His record in the National continued at the Shettleston level with 20th (1965), 11th (1966), 29th (1967) and 30th (1969), The effect on the club team was considerable with steady progress being due as much to his example and encouragement during training as it was in actual races. He was to run in 10 National Championships for the club missing only 1972. In the other big measure of a man’s ability and spirit, the Edinburgh to Glasgow he ran in 12 not missing a single run in his time with the club. He covered Stages One, Two, Four, Six, and Eight. He picked up places in the event every year until the mid 70’s but he also helped others – eg in 1968 he moved up from 16th to 14th on Stage Four and handed me the baton. I looked down the road and there were four eminently catchable runners strung out along the road in front like beads on a necklace – he had made up a lot of ground when he could barely see the next runner and made it easy for me to look good catching three of them. He did the same trick the following year with Sandy MacNeil, not only did he pick up places but he set up Sandy to move, as I had done, from 14th to 11th. By the time Allan Faulds joined the club in 1970 we had two very good men to head up the team and the spirit that Ian had cultivated really paid off over the next three years. He was also of course still racing on the hills with a second place in the Ben but victories all over Scotland from Arran to Newtonmore. Ian died of leukaemia in his early 40’s when he should have been looking forward to a career as a veteran athlete. We had known he was ill for some time but to start with we all thought it was less serious than it was, when we heard it was leukaemia we were all shocked. But he kept running right up to the year before his death. A man of many interests he was a very good mountain climber; he had a passion for gardening and had won the Wilson Medal from the Alpine Gardening Club and still trained seven days a week. Douglas Gemmell had been a pupil at Clydebank High School whose father had been a member of Springburn before the War and who was a natural athlete. Very quiet and unassuming, Douglas had a hard racing edge and a competitive calm that led to many first rate performances. Good on the track, very good over the country and, for me, even better on the roads. On the track he had personal best times of 8:39.0 for 3000m, 14:53.4 for 5000m, 30:53.0 for 10000m, 53:11.0 for 10 Miles track and 2:29.02 for the marathon. He only ever ran one marathon – unfortunately because he would probably have been very good. Nevertheless with medals at County and District levels he can be proud of his record. His record in the Edinburgh to Glasgow is excellent. Douglas ran in seventeen of them, sixteen in succession with the first being in 1965, and he ran on Stages One, Two Three, Four, Five and Six with the second leg being the one he ran in most – eleven years in succession! His record on the stage is that he was often in the top seven or eight times (remember these were the days of great Edinburgh teams as well as the Shettleston team from Glasgow) and only lost three places over the period while picking up a total of 15. The record in this relay is illustrated in the table below. On the country, he was consistently good, regularly in the top 50 and with many medals from District and County Championships and Relays. In the District Championships it had long been an ambition of the club to win the Maley Trophy for the winning team – this was clearly stated before the 1914 War in the club handbook at a time when the club was winning almost everything it could in the country. The ambition was achieved in 1973 and it was Douglas who led the team home with an excellent run finishing in fourth place. Although he was actually fourth, he was awarded the third place medal since David McMeekin of Victoria Park who had been third was awarded the first Junior (Under 20) medal. The pleasure for the club was increased because the huge trophy presented to the winning team had been donated by Willie Maley who won the Scottish 100 yards championship in 1906 in Clydesdale colours. This was not of course his first run in the event – that had been some time earlier. That was in 1966/67 in fact when the team was sixth and he was thirty ninth individual, second club counter behind Ian Donald who was in tenth place. He did not contest the event the following year but then a year later was third counter behind Ian Leggett (fourth) and Ian Donald (twelfth) when he finished twentieth and gain his first medal in the event when the team was third. Missing the 1969/70 event, he led the team into third place in 1970/71 when he was twenty sixth. In 1971/72 the team was second and then in 1972/73 came the moment that the club had waited almost seventy years for. The team was second again in ‘74/’75 but no awards were won for three years until 1979 when the team was second without his participation. The race was won again in 1980 over the rolling countryside of the Park and Golf Course at Dalmuir in Clydebank and the team was Phil Dolan tenth, George Carlin fourteenth, Gary Millar fifteenth, Douglas McDonald seventeenth, Robert McWatt twenty ninth and John MacKay thirty seventh. Gold, silver and bronze in the District Championships were his as was the honour of being the man to lead the club to its first ever team win in the event is a proud record. In the County Relays and Championships his record is even better. In 1967/68 he was a member of the team that was second in the championships and the following year went one better with second team in the relays and winners in the championships. In 69/70 it was first team in the relays and in the championships and this pattern was repeated the following year. In 70/71 it was first in the relays and second in the championships and in 1971/72 there were two firsts. Douglas was a fixture in all these teams and had bronze, four silver and five gold medals from the ten events. Ian Leggett was also an ever present and Ian Donald only missed one race with Bobby Shields, Allan Faulds, Cyril O’Boyle and Pat Younger all sharing in the successes. The run of successes for this extended period was unparalleled in the club’s history with the top four changing from time to time – initially it was Ian Donald, Ian Leggett and Douglas with Bobby Shields and Sandy MacNeil making up the team. Then for the three years of Allan Faulds’ membership it was a settled quartet of Douglas, Phil Dolan, Allan Faulds and Ian Donald then when Allan left the district and Ian’s illness seriously affected his running Robert McWatt, George Carlin and Gary Millar came into the team but the one man who was in all the teams in all the races below was Douglas. In 1976 he won the title over a frozen and rutted course at Braidfield Farm in Clydebank. The team record in the ‘Gemmell Years’ was as follows – 16 gold medals, 5 silver medals and 1 bronze summarised in the table below. Unfortunately he had a series of injuries and with business taking up more of his time he retired for a time although keeping fit all the while. He made a comeback to veterans athletics in the mid 1990’s. In the County Championships in a snowstorm in 1995 he was fourth individual. a member of the winning team and first veteran. The comeback continued with ninth in the vets cross-country and first M45 which led into track races over 5000m and 10000m. Veteran prizes were regularly won (eg the Greenmantle Dash) and in 1997 he was ninth in the Nigel Barge Road Race. In February he won the Scottish Vets M50 3000m in 9:32.8 and in the BVAF he won the British title with 9:27. In the BVAF Cross-Country championship he was second after a terrific tussle with Brian O’Neill. May, une and July saw almost incessant racing including the Tom Scott (54:17 – first M50), First M50 in the Vets 10M at Greenock in 56:33. In the Vets McInnes Road Race he was second and first M50. In the three Polaroid 10K’s that year he was first M50 in every one. In the Walter Ross race he was third and first M50. In the Scottish Vets 1500m and 5000m he won both in 4:36 and 17:01. he was first M50 in the Andy Forbes road race and in the 10000m track races over the summer he was remarkably consistent with two at 33:42 and one at 33:45. He had another excellent summer in 1998 when he topped the UK rankings for the 5000m. In November he was ninth in the vets international in Ballymena and was first veteran in the EU Braud Hills 6 Miles road race. He was first M50 in both Nigel Barge and Jack Crawford. Alas, he was again plagued by injury and really had to retire this time. Douglas was undoubtedly an top flight athlete who was just a bit unlucky with injuries but he would have graced any club at any time. Ian Leggett took up the sport in 1963 after becoming slightly disillusioned with football – at which he was a good player. 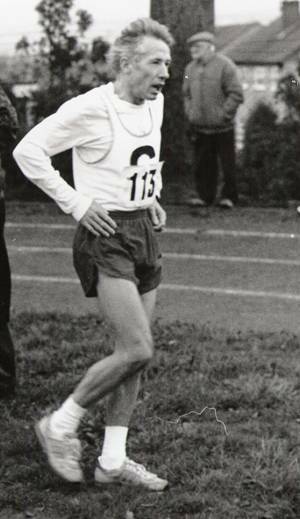 From then until he emigrated to Australia in 1966, he ran at a good club level winning medals in County events and running well on the track and roads. In 1966 Ian emigrated to Whyalla, near Adelaide, in Australia. He still pursued his athletic activities with Whyalla Harriers as well as playing some more football with Croatia and City football teams. Athletics were mainly track meets with the road racing being concentrated in the cities. At the start of 1966 he decided to concentrate on athletics and ran in the Commonwealth Marathon Trial. Unplaced he turned back to football but kept on running and also kept in touch with the club back home. When he returned to Scotland, he had been transformed as a runner. He enjoyed the cooler atmosphere and the road racing circuit that had been missing in Australia. 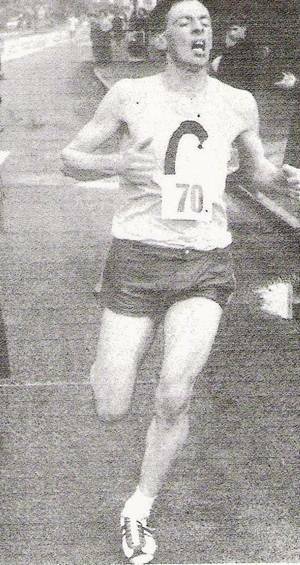 He quickly became one of the quality group of runners in the club at the time – Phil Dolan, Allan Faulds, Doug Gemmell and Ian Donald. He even tackled hill races at this point including the Mamore and the Ben. His best years were almost certainly from 1969 to 1973 with medals at County and District and Championship levels. The 1969 campaign can be summed up in the following table. It was a good period for the club and it was, as it always is, a disappointment when the squad finally separated – Doug Gemmell went to Edinburgh and Ian Leggett to Livingston for business reasons, Ian Donald died from leukaemia and Allan Faulds’s work also led him away from Clydebank. Allan and Phil Dolan are the subject of profiles elsewhere on this site.